Ozeki Call Centre Client With CRM Functionality is the best choice especially for call centres and any other sales organisation or department to handling customer information. 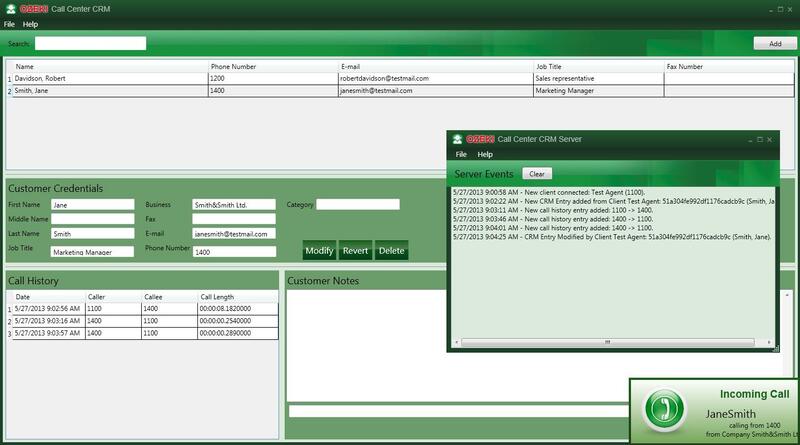 As this software saves and displays all customer data, you can easily identify the callers and manage your contacts. This way, you can make your telephone conversions more effective. Every customer has an individual record in the database, which contains all activities (calls, SMSs, emails, etc.) concerning that particular client. The system saves them automatically. Since the software stores all customer preferences and data, it is easy to load all known information (contact details, buying history, etc.) for the call centre agent about the customer who is currently in call. When the software have realised the caller, it will forward the call to the appropriate department, right people or IVR and setup the preferred language and answer method. All operations depend on the recognised caller's preferences. Analyse your database and create a personal and effective direct marketing campaing. The saved information (personal details, buying history etc.) can help you to formulate the most appropriate advertising text and select the right ad spaces. After you have installed it you need to enable that the software runs in the background. This way, it will work continuously. You can edit the existing user information if it is needed and seek a user in the database. Conduct telemarketing campaigns by using Ozeki Broadcast By Phone, Broadcast By SMS or Broadcast By Email. While calling with Ozeki Broadcast By Phone or Agent Dialler, the other party's information will appear from your database. Ozeki Call Centre Client With CRM Functionality makes your customer relationship management (CRM) more flexible, direct and personal by serving customer data for the right person, to the right interface in the appropriate time. For example: information about needs and wants for sales or marketing experts, personal information about the client currently in call, etc. It makes your customer contact point more persuasive and your CRM system more effective.